The Flagship Motorcourt is centrally located. Within 2 to 5 minutes walk to Board walk, State park Beach and Hampton Harbour. 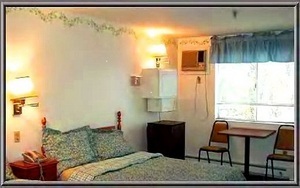 Our Hampton Motel was built in 1985 with many updates. The guest rooms are quaint and comfortably set back towards residential area away from Main road. Rooms are spacious and bright with large windows. Cheerfully decorated. Rooms with fridge ,microwave ac and comfortable mattresses. Some rooms with kitchens. Our guest return year after year for 20-25 years. Max Occupancy: 3 1 Queen bed which are cheerfully decorated and include a flat screen TV, refrigerator, a microwave oven,toaster, coffee pot, air conditioning grills with burners outside the room.Full bath and cable tv.